If your garage in the capital looks like a junk shop and keeps piling up with junk, let us provide you with a waste collection team and regain the space back from the black hole your garage has become. We offer a hassle-free and affordable garage clearance service in London to ensure your property is waste free. Operating in your local London area for more than ten years, we aim to deliver a fast and effective waste clearance service which will cost you less than the price of hiring a skip and save you the hassle of having to deal with the council. The junk removal operators we work with have been rigorously vetted and fully insured for your protection. 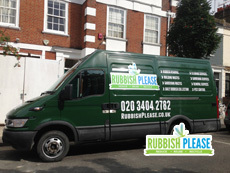 Rubbish Please manages highly skilled teams who have years of experience dealing with all kinds of garage rubbish removal based on your own personal requirements. We are proud that we can collect all types of rubbish except for hazardous waste and dispose of it in a responsible, eco-friendly way. Furthermore, we can even offer you a key pick up and delivery service for your convenience. The high-quality approach to our work and low-cost rates has gained us 95% positive feedback from our previous customers so why not join them and book garage clearance today? Hire Professional Rubbish Collectors TODAY! Our trained advisers are available 24/7 so you can make an appointment at a time that suits your schedule even at short notice. Simply call 020 3404 5556 to speak to a helpful member of our customer support staff. They'll offer you an online quote at amazing rates and answer any queries you might have. Alternatively, complete our contact form or use our instant chat service and we’ll get back to you without delay.